...seems to go into recursive/infinite loop? Archiver.app extracts it without error. The duplication most probably was because you run the operation twice, and one of the times inside the previous extraction? I did not got that result. As for the error, the file seems to be corrupt. 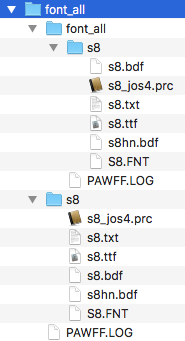 The file s8.bdf is only partially extracted. The original file was 878293 bytes but only 786432 can be extracted. I'm not sure why the Archiver.app does not show the error, but it also only partially extracts that file. Maybe you can try downloading that file again, in case it was downloaded. No, I do not run it twice. Also get bad table with this one, which results in two files from Keka. If they are truly bad, that is a shame. I will investigate. File in OP is complete download so must be bad file. Just reproduced the double compression, reopening this one. Thanks @gingerbeardman! Since 1.1.14 if UNAR fails P7ZIP is used instead. In this case UNAR fails but extracts some files then P7ZIP is used, hence the duplication. Just removing that first failed extraction. 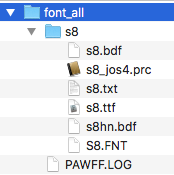 It's curious how some apps I've tried with this fonts file just ignore the existence of the damaged s8.bdf file.